At least 26 Pakistani Shia pilgrims killed in gun attack after forcing them out, kept in row & shoot at sight. This is the definition of Islam by Islamists. The pain and tears of Siahs do not reach to Allah and Mohammad as well. 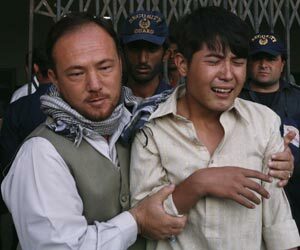 The Shia community has in recent years been subjected to numerous attacks by Taliban - Deobandi Islamists. ISLAMABAD | Tuesday 20th September 2011 | Shawwal 22, 1432: Bike-borne unidentified gunmen today shot dead at least 26 Shia Muslim pilgrims in cold-blood in southwest Pakistan’s Balochistan province after forcing them out of a bus. A bus carrying Shia pilgrims, which was going from provincial capital Quetta to the border town of Taftan, was stopped by the gunmen in Mastung district of Balochistan, an area considered to be the hub of banned Lashkar-e-Jhangvi. The gunmen ordered the passengers out of the bus and lined them up before firing at them indiscriminately. At least 26 people were killed and six others were seriously injured, Deputy Commissioner Shah Nawaz Nosharwani told the media. 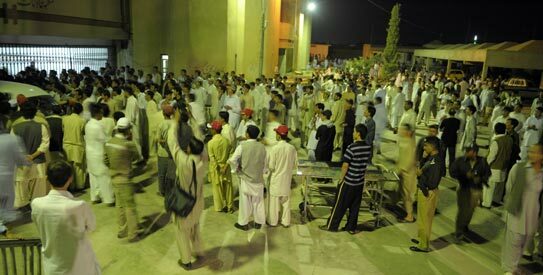 The injured were taken to hospitals in Quetta, located about 40 km from Mastung. The four gunmen who carried out the attack escaped on motorcycles. No group has claimed responsibility for the attack. Mastung is considered a hub of Lashkar-e-Jhangvi, a notorious sectarian group that has carried out many attacks on Shias across Pakistan. There was confusion about the total number of passengers in the bus, with reports putting the figure between 38 and 50. The Shias were travelling to Taftan, a border town from where they intended to cross over to Iran for a pilgrimage. Members of the minority Shia community have been repeatedly attacked in Balochistan, including in the provincial capital Quetta. Courtesy : AP | AFP | Reuters | TOI.